B.C. First Nation of Xeni Gwet’in to the Williams Lake Stampede. Just before noon in the Chilcotin Valley, Kaitlyn Lulua has her hands full. Ms. Lulua, 8, is trying to wrest the bridle off her horse so it can drink more freely from a stream. In the process, the headgear has become tangled and she is struggling as the horse snorts impatiently for water. Her father, Jimmy Lulua, 30, moves closer, keeping his own horse steady while he helps his daughter remove the bridle, loop it over a saddle horn and lead the horse to drink. The exchange takes place with few words and little fuss, one of many such lessons that happen every day during the Xeni Gwet’in Youth Wagon Trip. An idea hatched by Mr. Lulua and his wife, June, the trip is now in its seventh year and has become a highlight for the Xeni Gwet’in, a First Nations community based in the remote Nemiah Valley. The ride is particularly symbolic this time: It is taking place following a court ruling last year that confirmed the Tsilhqot’in Nation and its six aboriginal groups, including the Xeni Gwet’in, holds aboriginal title to about 1,900 square kilometres of interior B.C., including the Nemiah Valley. Mr. Lulua isn’t keen on drawing such connections, preferring to to focus on the ride’s role in fostering health, cultural awareness and self confidence among First Nations youth. When pressed, however, he says there is a link between last year’s Supreme Court of Canada decision and the wagon trip, one visible in the proud smiles of the youngsters who wave, unrattled by passing logging trucks, at camera-toting families on the banks of the Chilcotin River. “Both are about who we are as a people,” says Mr. Lulua. 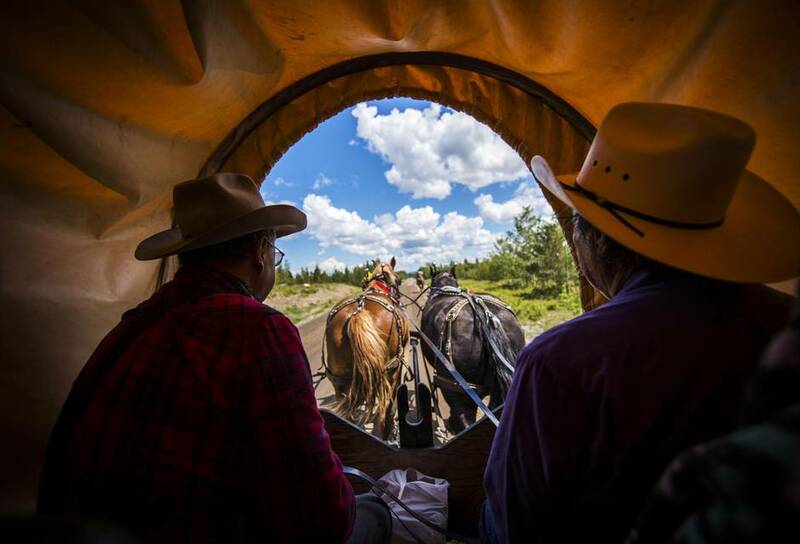 What: An eight-day, roughly 200-kilometre horse and wagon ride from Xeni Gwet’in, a First Nations community in the Nemiah Valley, to Williams Lake. When: The trip is timed to coincide with the start of the Williams Lake Stampede, which takes place each year around Canada Day. The Xeni Gwet’in group was scheduled to make a grand entrance Friday and to ride in Saturday’s parade. Logistics: Support includes an advance vehicle and driver who communicates with truckers along the route; a cooking and clean-up station that travels ahead of the wagon train; and a 450-gallon water tank to supplement water sources along the route. Cost: About $20,000 from community fundraising and donations. That pays for trailers, horses and wagons; feed for horses; and three meals a day for riders and volunteers. Trip rules: Riders under 17 years of age must be accompanied by a chaperone. No personal electronic devices. No drugs or alcohol. Riders supply their own tents and gear and, in most cases, their own horses. 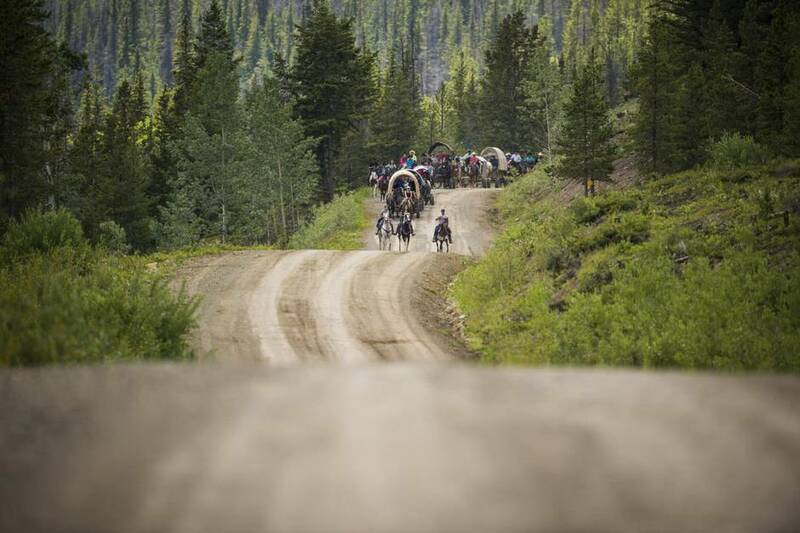 Who can ride: Young people from Xeni Gwet’in and neighbouring First Nations communities; non-First Nations participants who pass muster with wagon bosses. This year’s convoy: Six wagons, about 40 horses, roughly 100 participants including elders in their 70s and children as young as eight. Rules of the road: Riders and wagons keep to the right side of the road in tight formation. Riders are typically on the road for four to six hours each day. The wagon trip comes with modern conveniences including recreational vehicles, waterproof tents and portable generators. It also speaks to Tsilhqot’in history and culture, in which horses loomed large in trade, travel and daily life. Herds of wild horses roam the Nemiah Valley and Tsilhqot’in people relied on horses to traverse the wild terrain they have always considered their own. Xeni Gwet’in chief Roger William, the lead plaintiff in the title case, recalls traveling to Williams Lake by horse and wagon as a boy. Horses also bore the six Tsilhqot’in war chiefs, five of whom were hanged in 1864 and a sixth who was hanged the following year after what is known as the Chilcotin War. The conflict broke out during the Cariboo Gold Rush after the province authorized a road to be built from the coast to the Cariboo through Tsilhqot’in territory. Tsilhqot’in warriors attacked and killed the members of a road crew in April 1864. Within a month, 20 people were dead and a manhunt was underway. In August, 1864, some of the warriors agreed to meet with government officials for what they understood would be peace talks. Five were arrested, charged with murder and hanged. The sixth chief was hanged the following summer. B.C. Premier Christy Clark made an official apology for the wrongful hangings last year, part of an ongoing, bumpy process of recalibrating the relationship between the province and the Tsilhqot’in Nation. That political context is not much in evidence on the wagon trip. Each day begins with taking down tents, packing bags and saddling horses for the day’s ride. Cooks provide hot meals but riders are responsible for cleaning their own dishes and utensils and making their own lunch. At rest stops, the first task is ensuring horses are watered and tethered in shade, with bridles taken out so they can munch on grass. Evenings are devoted to games and campfire conversations. On a rest day midway through the trip, youngsters swam and played in the fast-running, icy current under a bridge over Big Creek. “It teaches [youth] independence, about culture and about our connection to horses. The only thing they don’t like is the 11 pm curfew and the 6 am wakeup call,” says Pam Quilt, a Xeni Gwet'in youth worker and volunteer. Mr. Lulua says the trip builds bridges – between young and old people, old and new ways and people and horses. It also connects neighbours and communities. One key player is Roy Mulvahill, a third generation rancher from the B.C. ranching district of Chezacut – his ancestors came from Ireland – who provides wagons and horses and carries a sheaf of photographs from past years’ rides that show no-nos such as riders straying on to the wrong side of the road. Visual reminders work better than lectures, he says. Mr. Mulvahill and his wife Gwen also provide several ‘kid horses’ – ones docile enough for the youngest child or greenest rider to manage. Mr. Mulvahill has the weathered hands of an outdoorsman and is missing the tip of his left index finger, having lost it to the bite of a rambunctious colt. He doesn’t find anything especially remarkable about the ride, reminding a reporter that in decades past, he and other ranchers would routinely drive up to 600 head of cattle to town for auction in the fall, timing the drives so they would arrive for Halloween. Cattle are now transported by truck. Conway Lulua, a cousin of Jimmy Lulua, is riding an Appaloosa called Winchester and has also been on the ride several times. “It changes people in a good way,” Conway says. “I used to be an alcoholic, I used to be a heavy drinker and a heavy pot smoker. Since going on the ride, I’m not doing that any more. It’s a good life, being sober. “For me, it’s almost like going into treatment. Skyryder Moses, 17, is from the Sugarcane reserve near Williams Lake and was invited to come on the ride by a friend from Xeni Gwet’in. Mr. Moses, 17, just finished Grade 11 and this year traveled to Ottawa on a Rotary-sponsored Adventures in Citizenship Program, in which he thinks he was the only First Nations kid in a group of about 200 students across the country. So he appreciates being part of a First Nations family gathering. Jimmy Lulua, who was named after an uncle skilled with horses, says he’s gratified by the community support the event has received. When he’s felt discouraged or had doubts about the event, he turned for advice to elders, who told him to trust himself and keep going. “I was always told that I would do something great with horses,” he says, sitting cross legged during a rest stop in Farwell Canyon.